• One of the 4 poster screens. This is the light blue, I believe. • One colour down, rockin’ that pink. 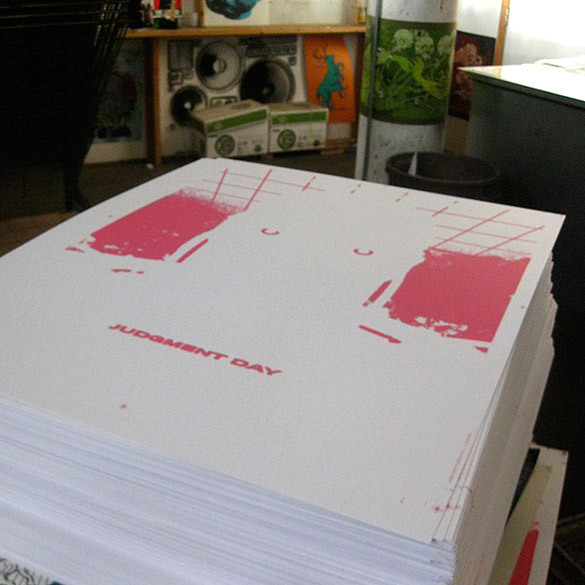 • I dunno, some kind of weirdo test print? Those Burlesque people are mad. • Three colours down! Starting to come together now man. • Then I find out those bums printed all the posters upside down. Get goddamn Mike on the phone! Things have been crazy around the HQ these last few weeks, lots of big projects in the works with several moving into the production stages. Lots to keep track of, lots of people on the ends of various emails and phonecalls, lots of folks hassling me for all kinds of stuff needed to keep things moving. Essential service! 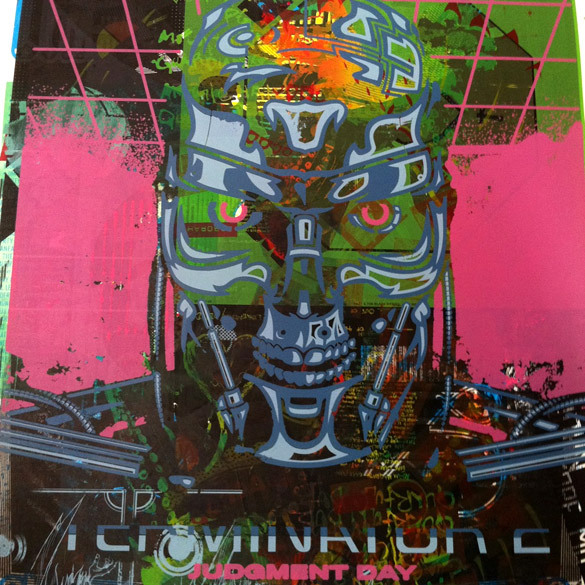 One of the projects that have been gaining some serious ground is the TERMINATOR 2 poster. Mystery Box have been doing an exceptional job laying the tracks before the train and Burlesque of North America have been killin’ it on the screen-printing. The good people down there have been sending me production shots as they moved forward, and whenever an email from them lands here all work stops. Screeching halt. So exciting to see this thing come to life. 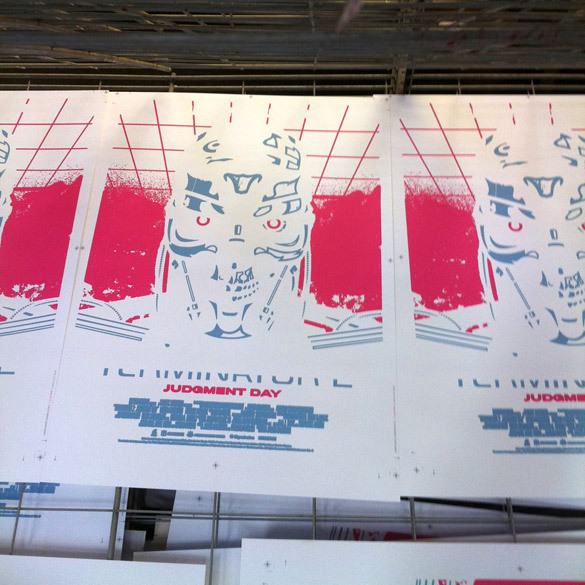 This will be my first official screen-printed movie poster and I’m quite appropriately “losing it” up here. Look at that pink! 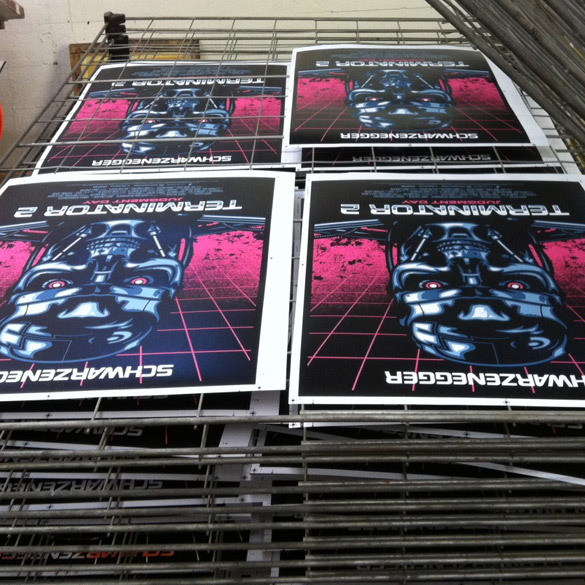 The launch of the TERMINATOR 2 poster is coming up fast, only a couple weeks away. This is part of a T2 double-header with my talented pal Tom Muller. I’m waiting on some final details and firm onsale information so watch this space and follow myself and Mystery Box on Twitter if you’re looking to nab one of these things. How much for the “Burlesque” one? 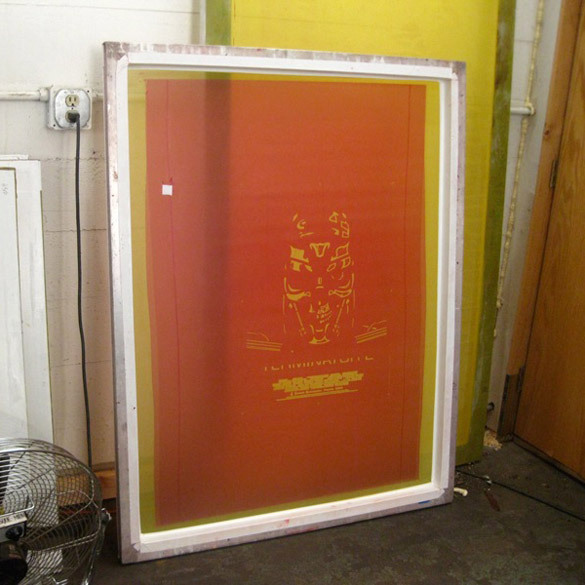 I need to go to NE MPLS and steal that test print! Ah, I can almost smell the ink! 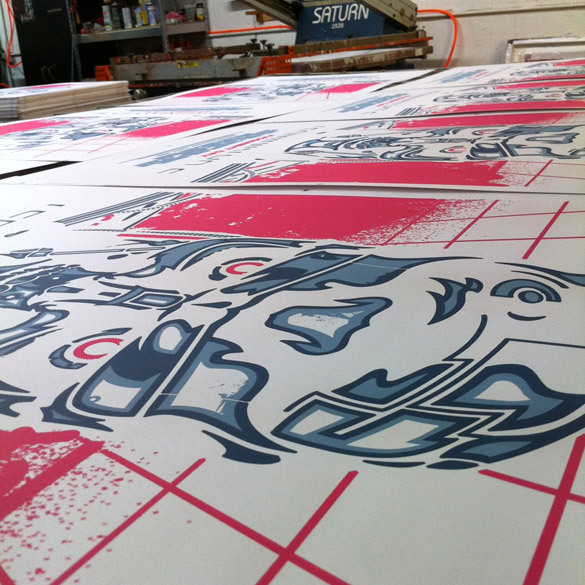 Love seeing screen prints coming together, great colour combo too. Love the industrial scenery of the shop. It’s almost like the Cyberdyne factory itself. I half expected the last shot to be Linda Hamilton lowering one of the posters into a vat of molten steel. Damn, too late to the party i guess… Is there any way to get my hands on one of those prints?